Do you use Microsoft Word to review and template your resumes? 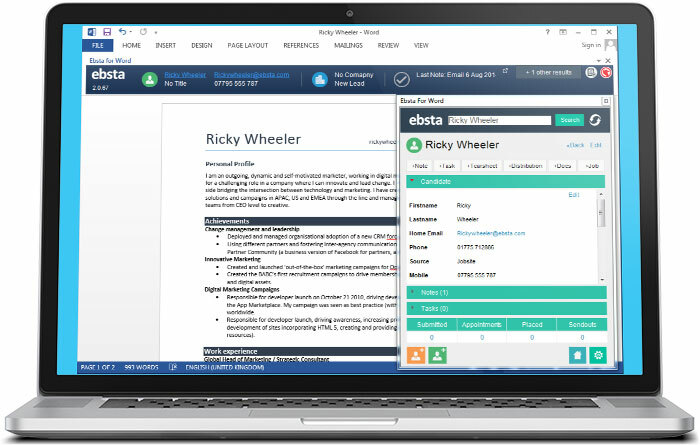 With Ebsta for Microsoft Word you can check for duplicates against Bullhorn, create new client or candidate records, add notes, set tasks and attach resumes to jobs in Bullhorn without ever leaving Microsoft Word. Sign up for your FREE 14 day trial to see why more than 7,000 Recruiters users across the globe rely on Ebsta every day. No credit card required.